Las Vegas is constantly changing and evolving. 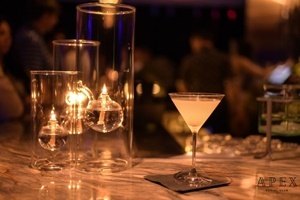 One of the newest venues to hit Vegas is known as Apex Social Club. Situated at the world-renowned Palms Hotel & Casino, Apex offers party-goers a whole new approach to the nightclub scene. 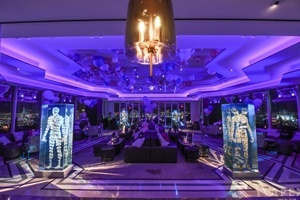 The venue takes over the space previously held by Ghostbar up on the 55 th floor of the iconic resort. With more than 8,000 square foot of space, Apex Social Club provides guests with a spacious club environment and open air terrace where Instagram-worthy 360 degree views are plentiful. Apex Social Club focuses on socialization to ensure that everyone has a great time from the moment they walk through the door. If you’re ready for the ultimate rooftop party, Apex is ready to deliver. The combination indoor and outdoor hangout has everything you’re looking for in a modern nightclub. When you arrive to Apex, you’ll be met with a spacious bar operated by some of the best bartenders and mixologists in the business. The DJs are just as talented, spinning a variety of top 40 and hip hop. Like all high-class nightclubs in Las Vegas, Apex Social Club offers professional bottle service for those who prefer to skip the long lines and get straight to their private table. With bottle service you’ll be provided with your own private severs and security staff. Finding a great place in Las Vegas to host a private event is not always easy. If you’re throwing a party, you want to work with a venue that is able to accommodate you quickly and efficiently without stress. At Apex Social Club, you’ll be glad to know that their staff will go above and beyond to ensure that your party runs smoothly from start to finish. Whether you’re hosting a bachelor party, bachelorette party, birthday party, corporate event, or just a girl’s or guy’s night out, you’ll no doubt be satisfied. Apex Social Club first opened its doors to the public on Memorial Day of 2018. Since its grand opening, the venue has quickly become the go-to destination for both locals and tourists visiting Las Vegas. When you arrive to Apex, you can expect an average wait time of about 20 to 40 minutes. The cover charge to get into Apex can range depending on the night but typically ranges from $20 to $40 for guys and is based on the doorman’s discretion. Apex Social Club is open Thursday, Friday, Saturday, and Sunday nights. As the club is popular, you’ll find that any night is a good one to visit. Following the strict dress code is a must at any of Las Vegas’ upscale nightclubs. At Apex Social Club, guys should wear nice collared shirts, jeans, and dress shoes. You will want to avoid wearing any type of sportswear, such as jerseys, sneakers, and hats. Pricing at Apex is in line with Las Vegas prices. Cocktails typically range from $15 to $20 on average. If you’re looking to splurge on bottle service, know that this service starts around $550 and goes up from there. Bottle service is the ultimate way to experience Apex Social Club, especially if you’re visiting with a group or you want privacy. While you’ll find tables spaced out throughout the club, some of the best booths can be found around the dance floor. Not only will get you to see all the action, you’ll also have easy access to beautiful women or men on the dance floor. The balcony tables are also a great choice, especially on nights when these tables act as the main tables. If you’re planning a visit, be sure to check out the lineup of upcoming entertainers.